To help you to quickly plan your stay with us, we have put together a set of frequent questions with answers curated from information gathered through thousands of inquiries made by our guests over the years. To help answer any additional questions, please take some time to review our campground rules and policies. How far is the beach from Campers Inn? The beach is just 750ft away! We have a pedestrian and golf cart crossing on Thomas Dr. with a beach access path adjacent to the gate next to the store. What is required to book a reservation? To make a reservation you have to be at least 18 years old with an I.D. We are a pet friendly park, However they must be kept on a leash and under the control of their owner at all times at all times. There is no exception to the leash requirement. How many vehicles are allowed on a campsite? We have no general rule here but do keep in mind the following: Your reserved site includes 2 adults and children under 10. If you have additional people with you over 10 years old, there is a $5.00 per day charge per person. We do not allow tents on RV Sites. One tent allowed per Tent Site. This means we would expect everyone camping with you would need to fit in your RV or Tent. If you need extra space for more people, please make arrangements for additional sites. Can my kids drive my golf cart or other vehicle in the park unsupervised? If over 16 & properly licensed, and mind our speed limit (5MPH) Yes. Children under 16 are not allowed to operate a golf cart or other motorized vehicle within the park at anytime without being accompanied by a properly licensed adult driver. No Exceptions. Are we allowed to have a campfire on our site ? Can we use Fireworks? Yes, as long as it is contained in an above ground fire pit with a screen cover only. No Fires on the ground! If you need firewood, see us at the store! Fireworks – Absolutley NO! Use of any fireworks is not allowed anywhere on Campers Inn property at anytime. Both ground fires and any fireworks that leave the ground are prohibited by county laws. Can we have visitors in the park? Yes, Our policy on that is all visitors must check in at the office and provide us with which site number they are going to. Visitors will receive a temporary parking pass if needed. For the safety and consideration to all of our guests we ask that you follow this policy. All park visitors must leave by 11:00 PM or you will be charged an additional $5.00 per person for the day. Do you have facilities for the disabled or handicapped? All of our public facilities are ADA compliant, including the Store, Reservation Office, Swimming Pool, Restrooms & Showers, and Winston Hall. We also have a Handicap accessible cabin. 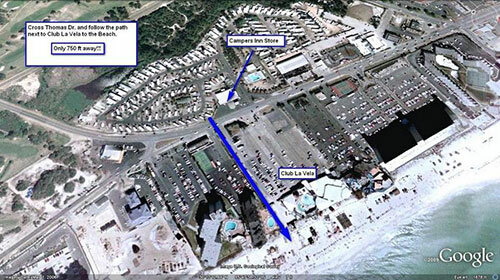 Our beach access path is also accessible to the sand dune. Specialized equipment is available to rent locally for the disabled to get out on the beach & to the water. Please inform our staff at the time you reserve a site if you have any special needs. What is in the cabins? One full-size bed, one set of twin size bunk beds, AC and electrical. You will need to bring your own bedding and other camp supplies. See more details on the Cabins page. We also provide an outdoor BBQ grill between each cabin.